Just a few useful facts and figures about the local conditions in Tarifa with links to weather and web cams. Water: 10-15 C (summer / winter suit). The climate in Tarifa is excellent - with daytime air temperatures averaging from 15 C in the winter (with some heavy rain) up to 30+ C in the summer (with welcome cooling winds). Check out the Windfinder site for the Tarifa wind satistics over the past few years. CostaSur's extensive Tarifa site also provides an excellent weather summary & satellite map. Up to date satellite feeds & weather for Spain can be viewed at AEMET - Agencia Estatal de Meteoro. See below for weather news plus live web cams. For an intro to the challenges of kitesurfing and the pleasures of Tarifa, try this intriguing article from the New York Times travel web site. Tarifa is famous for two prevailing winds that blow through the Straits of Gibraltar. The Levante from the East (slightly cross-offshore, left to right, looking out to sea) is most common in summer, when it can blow for weeks - day and night (although global climate change has made it a bit less predictable recently). It is generally stronger, warmer and produces flatter conditions. The westerly Poniente comes in from the Atlantic (nearly direct onshore from the right, looking out to sea), is cooler and can bring waves. The Los Lances white sand beach is generally 100mtr wide making launching / landing easy and is zoned to keep everybody happy. It has a very limited tidal range with a rock free, gently sloping sandy seabed. There is also a thermal effect that usually means the wind is strongest in the afternoon (such as at Valdevaqueros) ... ideal for party animals. Beginners kitesurfing courses often start at 10am! Conditions can change rapidly and a gentle force 3 / 4 can be a 6 to 7 within half an hour. It is often VERY windy - with a 40 - 60% chance of a Force 4 or over (Beaufort) every day of the year. 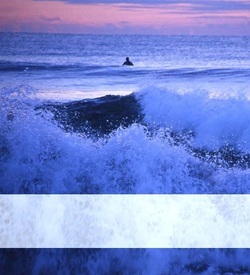 Click here for general info on Tarifa & surfing conditions. (Courtesy of Planet Kitesurf). SpotFav provide details of a number of spots across the region, some with live web views including a couple of local Tarifa beach cams (logon is required for the live views). 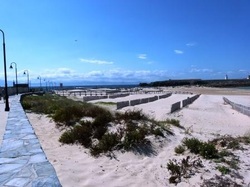 These currently provide views of Balneario (near the Isla), Los Lances Norte (Arte Vida) plus Valdevaqueros (Tangana) - which is further down towards Las Dunas. Tarifa has been Europe's best kept secret for windsurfing for over 30 years and has had a rapidly growing kitesurfing community for at least 15 years (check out the list of kitesurfing spots on the GoTarifa site). Tarifa is often used to test new designs, hosts international events and has a thriving local surf community - from leisure through learner to pro and manufacturer. There is usually someone out just about every day of the year (it is still very mild even mid winter). Surfing from the main Los Lances beach is restricted in high season and even the Dos Mares end can get a bit crowded in July & August, often with 200+ kites / windsurfers riping it up. However, there are 10km to chose from and lots of other great spots just a short drive away - like Valdevaqueros, Palmones, Getares or a bit further away to the stunning Canos de Meca beach (and not just because of the occassional new age nudist!). Windsurfer, kitesurfer and public zones are strictly managed to keep things sweet and the sandy beaches are as clean as you will find anywhere in Europe. There is a short tide range, no reef and very few rocks. Kiters should bring 8m - 12m kites (plus 6m in winter & maybe a 14m in summer). Shortie wet suit Jul-Sep, just in case, and 2/3mm full suit for winter. And do remember to wear your helmet - better safe than sorry! Bring a wind proof jacket, jeans/sweatshirt for evenings and something waterproof & warm (especially in winter). Make sure you bring plenty of waterproof sun block, lip balm & after sun - as the UV is very strong, even in winter. Mosquito repellent and mats are recommended (other than in winter) - especially for the odd calm evening/night.